Before anything else, let's be clear about one thing, this isn't DOTA, DOTA 2 or WOW, although the Heroes in the game looks familiar to those games, the game mechanics aren't. Here, you'll need to form teams or groups of heroes to fight for you, unlike DOTA that you just need to focus on 1 Hero. - Look for this "Red Dot" every after battle to check your progress, or to claim a reward. Note that new quests won't unlock until you claim the reward first. - Complete to get various rewards. Note that some quests will not appear until you visit the Quest screen. - The Feast: Check the given time and claim your Free Energy during that time. Note: Missed rewards can't be reclaimed! - Golden Gauntlet: Unlocked at Team Lvl 12. Do this only once a day to get the Team Lvl EXP. - Monthly Card: This is optional for F2P gamers. - Enchanting Equipment: Do this only once your Hero reached Purple+. Check and prioritize stats that is important for that Hero first, especially weapons. Unlocks at Team Level 20. - Do not waste your Coins for Salve Chests, just use your "free chances" for some extra items, and to complete the "Stone Circle" Daily Event. Spend your Coins into more useful options like upgrading skills. - At later levels, once you have excess Coins, it is ok to spend them on "Buy 10" Salve Chests to get some free heroes (if lucky), gears (including purple), and Hero Soul Stones. Make sure you have a couple of millions though for upgrading skills. - Your first Emmental Chest draw has a high chance to reveal a nicely evolved Hero, so it's a good idea to spend your first 200+ Diamonds for this one early game. - After the first one, just get the free Emmental Chest after the cool-down timer (about 2 Days). - If you are a heavy or casual Diamond user, get the "Buy 10" Option to get 1 guaranteed Hero as a bonus. For Free 2 Play gamers, earn your extra Diamonds for this one. - Go and "Like" their Facebook Page then click on the "GET FREE DIAMONDS &COINS" tab. - Follow the instructions to get your Promo Code, then enter it in-game: Go to your Avatar > Settings > Promo Code section . Use the Diamonds for your first Emmental Chest. Continue the tutorial until you get all starting 5 Heroes, just reach what you can with your current team. Do this while following your Quests or Daily Events. - Getting 3 Stars will unlock the "Auto Fight" feature for Normal Battles, and the Pass option ("requires pass cards"). I think this will unlock once you get your first Pass Card from stage drops. - Both Battle types will require Energy. EXP and drop rates are almost the same. - Team Lvl is the most important aspect in the game. It will unlock new features and strengthen your Heroes by lifting up their Hero Lvl and Skill Lvl caps. It also increases your Max Energy for more gameplay time. - Get Team EXP from battles and Daily Events completion rewards. - Eva: A team healer and can convert 1 enemy to your side. Treat Eva well, and you'll see what I mean. Very useful for Crucible of Fire or PvE teams. - Naeria: Check the Arena rankings and you'll still see players using her because of her crit attacks, useful debuff and team buff skills. - Odin: Although he is kinda weak at first, still level him up. He is useful for Crucible of Fire due to his insane damages and energy regen, even better when buffed! - Ember: Powerful single and AoE attacks, useful for added DPS. HP is kinda low so replace her with someone better at higher levels. Still good for Crucible of Fire though, and she will come back late game with her Awakening skill. - Captain: Still useful early game, use her until you get a better Front line Hero. His first 2 skills can stun enemies, use his Ulti right after your enemy casts a skill to cancel that skill. Similar to Ember, Cap will come back late game as one of the viable tanks. - Don't just focus on 5 Heroes, you need a 2nd or 3rd Team too, to help you out in the Crucible of Fire (only Lvl 20+ Heroes can be used), Epic Arena, and more. - Team Lvl 7: Skills Upgrading Unlocked. - Ultimate Skills can be activated when the Power bar is full. It is filled when your Heroes attacks, gets attacked, or if they will do last hit kills for +300 Power bonus. - Note: Power and Hp Regen only triggers between waves or battles. - Front line Heroes can easily activate their Ultimate skills because they get hit a lot. Depends if the Ulti is useful though, if your tank's role to just to absorb damages ("ex: Leo"), then it's ok to lightly upgrade Ultimate skill. - I'm sure you are wondering if which heroes to promote more? I'll say, all that you can, focus on your main 5 Heroes, then work on the next ones. - If you have extra Energy and you don't know where to use them, I recommend that you farm "Boots", or any item or "materials for crafting" that can be used every promotion. - Team Lvl 11: Heroic Chapters will be Unlocked. - I recommend you farm them all, since they are only available to farm trice a day. This is also a nice way to spend some of your excess Energy. - Heroic Stages: When farming Soul Stones, the chance is just around 33%, so other players do this: Once they get 1 Soul Stone, stop farming on that stage, this is because most of the time, once you get the Soul Stone, it will never drop another. - Highly recommended heroes to farm from Heroic stages early game: Leo and Medusa, then Marina and Gabriel. - If you already have the Hero, Soul Stones will just be used as Evolution Materials, farm them if you have extra Energy to use. For now, focus first on getting more Heroes and upgrading your main Heroes' Lvl and Skills. 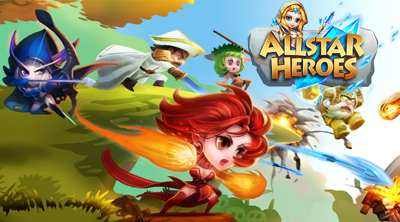 - Evolving Heroes will increase their Stats Growth Rates. I highly recommend farming these Hero Soul Stones from Heroic Stages early game: Leo, Medusa, Naeria, Eva, Marina and Gabriel. - get more Coins for upgrading skills. - Even if you can't play much everyday, at least buy 120 Energy per day. Golden Gauntlet: Do this only once a day to get the Team Lvl EXP. - Your first Emmental Chest draw has a high chance to reveal a nicely evolved Hero, so it's a good idea to spend your first few Diamonds for this one early game. - Well, this is kinda hard for F2P gamers because the required Diamonds is somewhat high, it's better to spend Diamonds to Energy and farm Soul Stones to get specific Heroes early on, then just earn your excess Diamonds for this as you go on. Aim for the first draw to get a nice bonus hero. - For VIP gamers, this feature is a good way to spend some extra Diamonds, especially early game. It is still luck based though but you will probably get at least 1 new Hero. - A nice place to get Diamonds, Coins, Gladiator Medals for the Arena Exchange Shop, EXP items, and more. - Note: Only use Gladiator Medals for Hero Soul Stones. - Fight teams with lower Team ATK than yours to get a higher chance of winning. Free Diamonds will be rewarded depending on the difference of your highest rank to the next one. - If you can't win anymore, you an still purposely lose fights to complete the "Arena Master" Daily Event. After Chapter 2: Trader Unlocked! - If you have extra Coins, buy some here in-case you'll need the items for later, especially EXP potions. - A nice place to farm EXP potions and Coins. - Note: Never sell your EXP Potions or Items! - Although it's tempting to sell them for Gold Coins, especially early to mid game, I would still recommend that you keep them for later Lvls, for your core or other Heroes. - Never Enchant before Promotion, or else, you'll just waste a lot of Coins. All Stats from Item Enchants will NOT carry over after Promotion, only the base stats of the items equipped. - A nice place to get useful items and more. 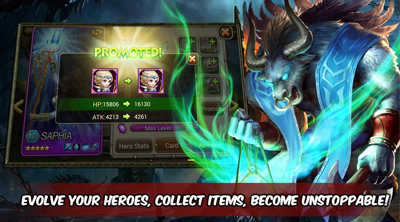 - Check the tip above the hero selection screen to get an idea. - The best way to earn lots of Coins, especially if you can reach and complete 15/15 Stage to claim over 500,000 Coins!. Plus. it doesn't require Energy to play. - But you can open chests every after battle. Rewards can be Coins, Items, Hero Soul Stones and also a chance to instantly acquire Heroes! - Rewards increases depending on your current Team Lvl. - Only spend your Crucible of Fire points on Hero Soul Stones! Team Lvl 32: Create or Join a Guild! - Some Guilds will require you to apply, but others will let you instantly join them. - Join a guild with a good number of active players. If you can't find any open to all Guild, go to the Global Chat then find Guild IDs there posted by other players. Enter the guild ID using the Search option under Guild feature. - Dispatch a Hero, if your guildmates hires your Hero, you'll get a nice amount of Coins! - If the majority of your guildmates' Team Lvl is around Lvl 40, you might want to deploy Heroes with around Lvl 40 too, this way, you'll get a high chance that your Heroes will be hired. - Recall Hero to claim Coins. - To hire a mercenary, go to any stage battle. Access the hero selection screen then select the Camp Tab. Open up a slot then choose a Hero for that Stage or Mode. - Use this option wisely, especially for Crucible of Fire stages or other in-game features! - How to Leave Guild? - Go to your Avatar or Account settings screen ("upper left corner"). Congratulations! If you reached this point, then I hope you already know what you are doing. Coins, Energy and Diamonds shouldn't be a problem, since you already know where and how to get them.